Researchers from Japan have developed a new polysulfide donor: a chemical compound composed of chains of sulfur atoms that can artificially increase reactive sulfur species (chemically reactive molecules containing sulfur) in cells and tissues. This donor is believed to be an excellent candidate for a new anti-inflammatory therapy because it has an extremely high anti-inflammatory effect. In the cells of many organisms, metabolites called reactive sulfur species (RSS) are made from the amino acid cysteine. Recent studies have revealed that RSS protect cells from oxidative stress and, under certain conditions, have the important function of maintaining mitochondrial respiration. Polysulfide donors are expected to be an important tool in investigating the function of RSS, and are being developed all over the world. However, their therapeutic effects remain to be discovered. A collaboration between researchers at Kumamoto University (Kumamoto, Japan) and Tohoku University (Sendai, Japan) has succeeded in synthesizing a new polysulfide donor by linking multiple sulfur atoms to acetylcysteine, an artificial amino acid. 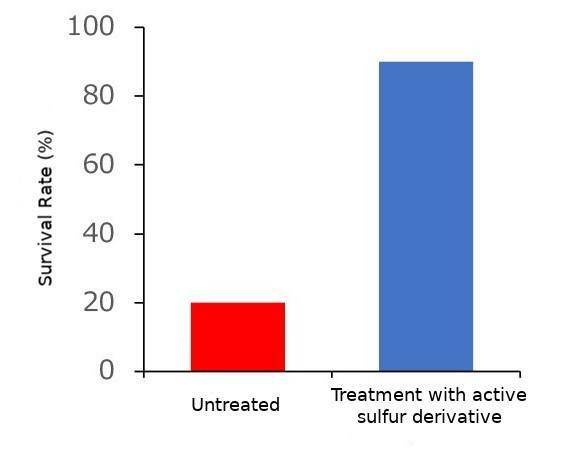 Their experiments revealed that the new donor was able to quickly penetrate into cells and greatly increase the RSS content by transferring extra sulfur atoms to intracellular cysteine and gluthathione. When immune cells were treated with the donor, macrophage response to stimulation by various inflammation-inducing substances (e.g., lipopolysaccharides derived from gram-negative bacteria) was greatly inhibited. In other words, the researchers found that their new polysulfide donor was very good at reducing inflammation. To confirm its anti-inflammation properties, the polysulfide donor was administered to mice suffering from endotoxin shock–a condition that often leads to death due to excessive inflammation. Compared to non-treated mice, the survival rate significantly improved. This research was posted online in Cell Chemical Biology on 7 March 2019.